The KT-1P trainer aircraft is an export version of the KT-1 basic trainer aircraft. Image: courtesy of Jorge Merino. The Peruvian government acquired a total of 20 KT-1P aircraft by April 2017. Image: courtesy of Korea Aerospace industries. The first KT-1P aircraft produced in Peru made its first flight in April 2015. Image: courtesy of Bryan Luna. The aircraft is powered by a Pratt & Whitney PT6A-62 engine. Image: courtesy of Galeria del Ministerio de Defensa de Perú. The KT-1P trainer jet features a glass cockpit. Image: courtesy of Meggitt Avionics. The KT-1P is an export version of the KT-1 turboprop basic trainer aircraft, jointly developed by Korea Aerospace Industries (KAI) and the Agency for Defence Development (ADD) for the South Korean Air Force. The Peruvian Air Force (FAP) received a total of 20 KT-1P trainer aircraft under a strategic alliance with South Korea by April 2017. The aircraft is intended to provide basic training for the FAP’s pilots and perform tactical flights in patrol and support missions in the Vraem region. It can also be deployed in missions such as counter-terrorism, drug trafficking, and illegal mining in the Valley of the Rivers Apurimac, Ene, and Mantaro. Produced in Peru, the first KT-1P performed its maiden flight in April 2015. PeruSat-1 is a very high-resolution Earth observation satellite system being built for the government of Peru. The Peruvian Government signed a $210m agreement with Korea to acquire 20 KT-1P military trainer aircraft in November 2012. Four of the 20 aircraft were exported by KAI, while the remaining aircraft were jointly manufactured by KAI and the FAP’s Maintenance Service Department (SEMAN) in Peru. The FAP’s SEMAN manufactured structural parts and performed final assembly for 16 aircraft. KAI managed training, implementation and delivery of special tools and equipment at its local production base at Las Palmas Air Base in Lima. Production of the KT-1P aircraft in Peru began in May 2014. The first two aircraft were deployed by the Peruvian Air Force’s No.51 Air Group based at Pisco in October 2014. The new KT-1Ps replace ageing EMB-312 and MB-399 aircraft operated by the FAP. 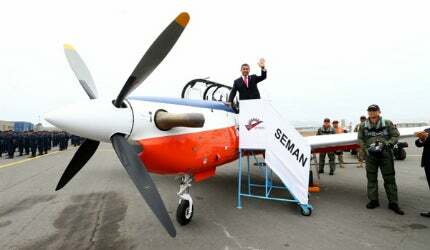 "The KT-1P aircraft is 10.3m-long and 3.7m-high, and features a fixed wing design and tri-cycle landing gear." The KT-1P aircraft is 10.3m-long and 3.7m-high, and features a fixed wing design and tricycle landing gear. It can seat up to two pilots in tandem seating configuration. Its aerodynamic design allows pilots to operate at a safe altitude. The KT-1P aircraft’s glass cockpit is integrated with Esterline CMC Electronics’ Cockpit 4000 avionics suite, which comprises head-up display camera (HUD), HUD repeater, integrated avionics computer, front and rear upfront control panels, 5in x 7in multifunction display (MFD), multiple interfaces, communications, navigation systems, sensors, armament interface, embedded virtual training capability, and embedded air combat manoeuvring instrumentation. The system integrates communication and navigation units, including UHF, VHF, HF, INS / GPS, data link, REC navigation system, air data navigation, and a TACAN RT-1634(V) tactical airborne navigation system. The trainer jet also incorporates Meggitt Avionics’ integrated secondary flight display (iSFD) for displaying air speed, critical altitude, attitude, and heading data. "The trainer jet has a maximum speed of 450km/h and a range of 688km, and can reach a maximum height of 10,000m." The aircraft is powered by a single Pratt & Whitney PT6A-62 engine and fitted with a four-blade HC-E4N-2D / E9512G(B)-1 propeller. Fuel capacity of the aircraft is 110gal. The trainer jet has a maximum speed of 450km/h and a range of 688km, and can reach a maximum height of 10,000m. The G limit of the aircraft is between -3.5g and +7.0g and endurance is four hours. In December 2012, Esterline CMC Electronics was selected by KAI to provide its Cockpit 4000 integrated avionics suite and glass cockpit for ground and flight testing of the KT-1P aircraft. Meggitt Avionics announced in March 2013 that the company would modernise the secondary displays, heading and air data units installed on the KT-1 for the Peruvian KT-1Ps. L-3 Aviation Products was selected by KAI in June 2013 to supply TACAN RT-1634(V) tactical airborne navigation system for installation on the KT-1P trainer jet. The KT-1 basic trainer is available in five variants namely KT-1T, KT-1B, KT-1C, KA-1, and KTX-1 Yeo-Myung. The export versions, KT-1T and KT-1B, have been developed for the Indonesian Air Force and Turkish Air Force respectively. KTX-1 Yeo-Myung is the first prototype built by KAI, KT-1C is an improved combat export model, and KA-1 is an armed trainer with light-attack capabilities.